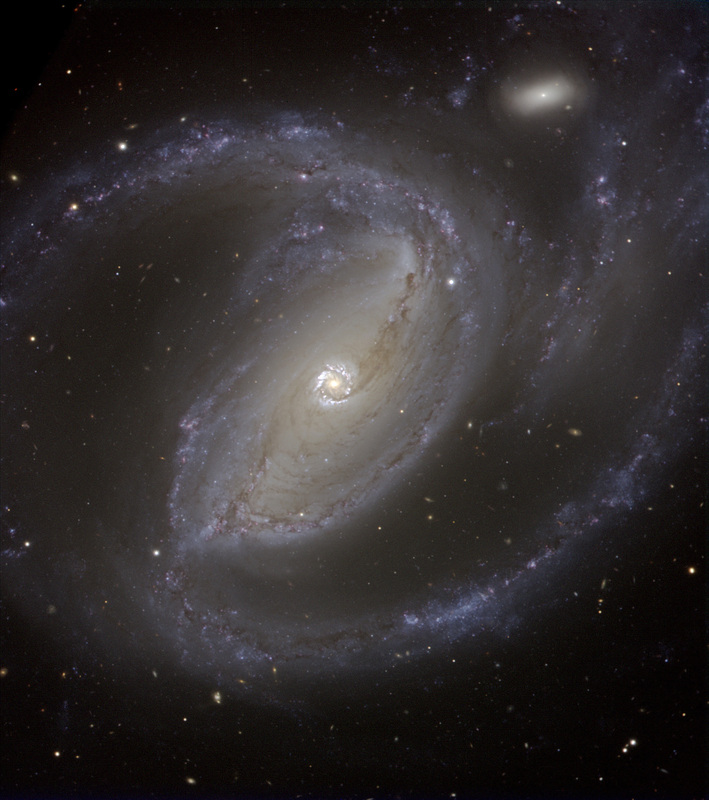 50 million light years away in the southern constellation, Fornax (furnace) is this beautiful barred spiral galaxy cataloged as NGC 1097. The sweeping blue spiral arms dotted with pink star forming regions and vast dust lanes are a sight to see. In this image you can see a smaller elliptical satellite galaxy cataloged as NGC 1097A near the top of the image and in addition to that you may have noticed the beautiful bright ring near the core of this galaxy. This ring is roughly 5,000 light years in diameter and is bursting with stellar formation. This ring is being powered by a supermassive black hole with a mass of 140 million times that of our Sun. 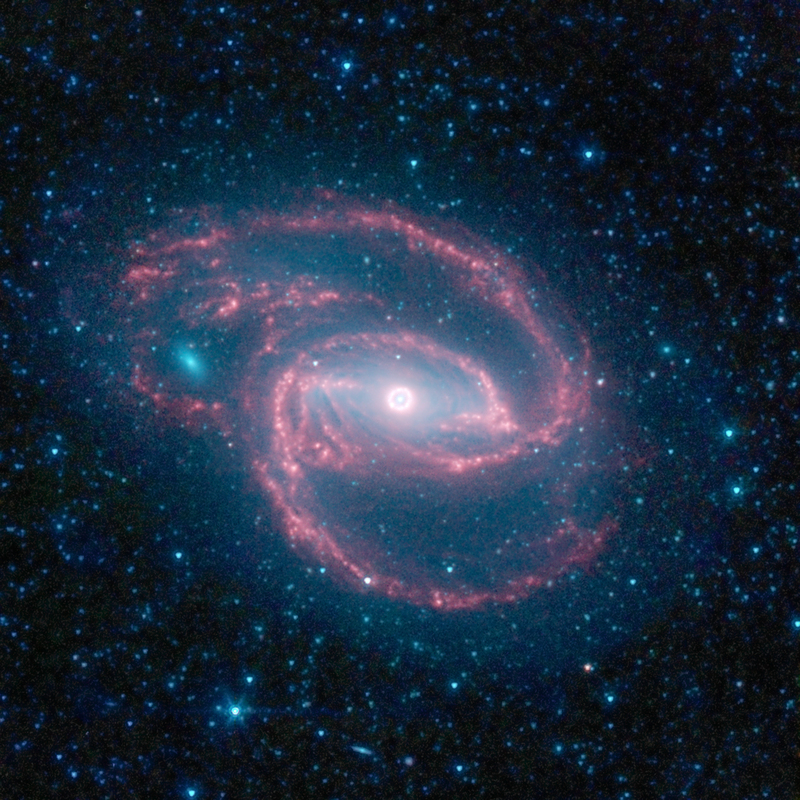 Below is an image of this beautiful galaxy in infrared provided by NASA’s Spitzer Space Telescope. HOW FAR AWAY IS IT? : About 50 million light years. HOW BIG IS IT? : Roughly 80,000 light years in diameter. WHERE IS IT? 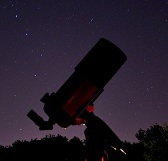 (General): Southern constellation Fornax (Furnace). WHERE IS IT? (Exact RA/Dec J2000): RA 02h 46m 19.0s / Dec −30° 16′ 30”. Image | This entry was posted in Astrophotography (DSOs), Galaxies, Images and tagged Astronomy, Astrophotography, Caltech, Cosmology, DanSpace77, Galaxy, JPL, NASA, NGC 1097, Sctronomy, Space. Bookmark the permalink.